Context Menu Editor can view and delete links to programs on your context menus (the popup menus you see when you right-click). 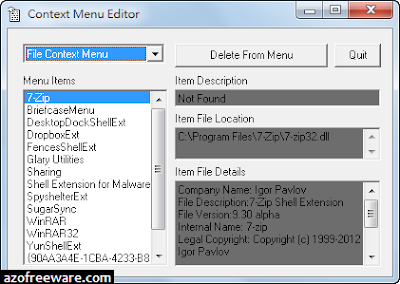 Context Menu Editor does not delete the programs, it just removes them from your menus. Menu deletions cannot be undone so please use with care - you may need to reinstall your software if you want them back. Context Menu Editor can view and delete menu items for right clicking on files, right clicking on folders and right clicking in Internet Explorer. Try Context Menu Editor today to see just how clean your menus can be!